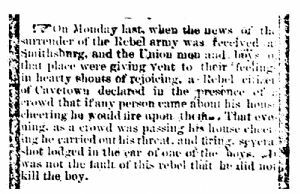 On Monday last, when the news of the surrender of the Rebel army was received at Smithsburg, and the Union men and boys at that place were giving vent to their feeling in hearty shouts of rejoicing, a Rebel citizen of Cavetown declared in the presence of the crowd that if any person came about his house cheering he would fire upon them. That evening as a crowd was passing his house cheering he carried out his threat, and firing. Several shot lodged in the ear of one of the boys. It was not the fault of this rebel that he did not kill the boy.